Flat Creek Saddle shop began in Jackson Hole Wyoming in 1982. FCSS prides itself in being an “old time” Western saddle shop with emphasis on customer satisfaction, service, and a huge inventory of 250 saddles, chaps, chinks, accessory tack, custom belts, saddle pads, blankets, and pack equipment for horses and mules. 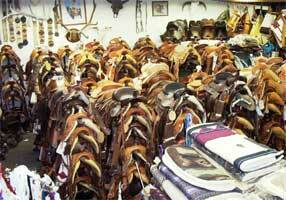 FCSS saddle inventory is one of the largest available – consistently stocking 250 new and used saddles. A few of the brands we carry are Courts, McCall, Circle Y, Longhorn, Martins and Tucker, we can also custom make saddles from a variety of makers including Castagno, Nicholson, and Bob’s Custom Saddles to name a few. Because of the extent of our inventory we often have horse owners bring their horses to us for custom fitting of saddles from our store. We believe a saddle should fit both the rider and horse properly and we are more than willing to help you find a saddle with that goal in mind. If we ship a saddle to you and it doesn’t fit, it can be returned for a refund or exchange which ever you prefer. FCSS also stocks a large number of saddle pads and blankets by 5 star, Reinsman, cool Back, Mayatex, Dale Chavez, Classic Equine, Professional choice, Diamond wool, Impact Gel to name a few. We also carry Double Diamond, Big D and Weaver Halters. We carry equipment for the arena enthusiast including a large number of headstalls, tie Downs, martingales, breast collars, bell boots, splint boots and other leg protection, winter horse blanket and coolers. Our bit and spur selection covers large range of companies from Reinsman, Greg Darnell, Les Vogt, Slister, Lynn Tomlinson, Tom Balding and others. We are located in the mountains of Wyoming about fifty miles south of Yellowstone National Park. We are also surrounded by some of the best Big Game Hunting in the lower 48. Because of this we carry a large variety of hunting and pack equipment for the horse enthusiast. Flat Creek Saddle Shop stocks a number of custom made pack saddles for both horses and mules, saddle bags of various sizes and materials, scabbards, hobbles, bells, electric fence supplies and much more. We wish to help our customers personally so at this time purchases may not be made through the site but if you find something you are interested in please call us on our toll free line: 1-888-772-3353. We would be happy to assist you with any questions you may have. Thanks for Looking!